A few weeks back, we ran a story about Honda Malaysia Racing Team getting back on track, literally. 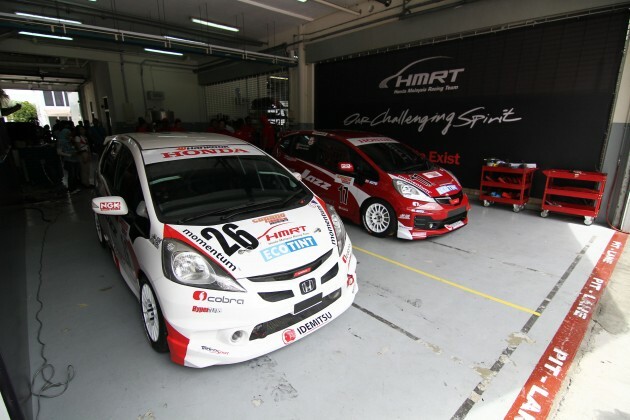 And that they will be fielding two souped-up Honda Jazz cars to compete in the Sepang 1,000km Endurance Race – Car 17 and Car 26. Our stickers are on Car 17, the red Jazz, just so you know. Since the story ran, both cars have undergone more development to get them ready for the race. But there’s a problem and it is one that’s not easily tackled. The team is not happy with the current rear suspension setup; the torsion beam is making things tougher. 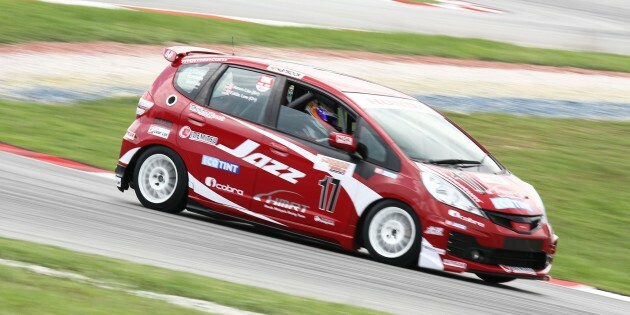 Since its first test in Sepang, the Jazz have slashed four seconds off their lap times, thanks to the remapped ECU, tweaked camber, different gear ratios and a more powerful engine. The team now has to sort out the rear, although they admit the H-beam suspension set up does not allow a lot of tuning options. “I think we’ll earn an extra second if we get the suspension right,” said Farriz, Car 26’s other driver. He added that the race is not about power. Since it is an endurance race, the driver has the added challenge of wearing out the tyres or using up all of the fuel too quickly. Car 17 will be driven by Aaron Lim and Eddie Lew. If you’d like to catch the action, the 1,000 km-long race starts at this Saturday, December 8 at 12 o’clock in the afternoon and should be finished at 9.30 pm, depending on the weather. We’ll leave you with a short video clip, which properly introduces the notable members of the team. You’ll also get to see the team, and the car, in action. this modified with a manual gearbox or using the original cvt?? Car 17 doin 2:40s! Respect! Good luck HMRT! What engine are these car using? Legendary K20A? or customized stock engine? you guys should use white and red sticker instead of black and red sticker on that car. the black colour is definitely not making the sticker stand out enough. it’s not very easy to notice the sticker in the photos oledi, so it can only be harder when the car is moving rapidly on track. Never quite understood HM Malaysia of using the Jazz. More puzzling is why the loose rear end would prevent them from going full throttle at the corner exit. Sepang is smooth as silk unless you run over the rumble strip…and even then flooring it past the apex would only serve to stabilize the rear end. I wonder what engine they are using. 2:40 is a pretty respectable time. “We are the…. Best! Best! Best! Next Post: otofest 2012 car sales carnival starts tomorrow!